Centuries ago, the moon Anarres was settled by utopian anarchists who left the Earthlike planet Urras in search of a better world, a new beginning. Now a brilliant physicist, Shevek, determines to reunite the two civilizations that have been separated by hatred since long before he was born. 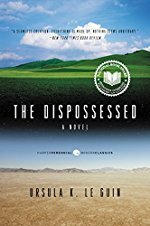 The Dispossessed is a penetrating examination of society and humanity -- and one man's brave undertaking to question the unquestionable and ignite the fires of change. Thank you for this post. I recently decided to reread this. When I was in college, I read it for the first time, and I remember that I was drawn along while also outright refusing to buy that the Anarresti could be so completely and uniformly anarchist and outside the idea of any kind of property rights. Even great apes know the principles of trading, and animals are extremely strong on the subject of "mine." Why wouldn't people have developed a Soviet-style black market of contraband? I am giving the book another chance partly because I don't remember that I finished it, but also because I want to feel closer to LeGuin around now. Countess Elena, it's worthy keeping in mind that the people of Anarres ate revolutionaries, with revolutionary zeal. We see the society through the eyes of someone who is especially committed to the ideals of Anarres, but even he feels possessive of some things - knickknacks, particular housing and so forth. And there are definitely people who exploit the system even without accumulating possessions. That's why it's an ambiguous utopia, because its collective decisions are ultimately made by individuals who may be jealous or spiteful or shortsighted. One of my favourite books ever. Le Guin combines such a potent, relevant metaphor with a plot that actually rockets along. It's tragic, beautiful, comical. Shevek himself, troubled, a little arrogant - in his attitudes to both planets, ultimately learns how little he knows. The bit when Shevek and his friends lock one of them inside a "jail" and it messes them all up is so powerful. And the bit when he finally gets away from his keepers on the main planet. Ok I need to read it again because my memories are too vague about everything that happened. The Dispossessed Ursula K. Le Guin - By portraying the limitations of her utopia, Le Guin avoids the one-dimensionality of early utopian fiction; also, by showing the tension between theory and practice, she is able to bring Anarresti ideals into sharper focus. This is an important aspect of the book, for the idea of Anarres, as well as the human ability to conceive that idea, is as vital as the imperfect reality of Anarresti society. Anarres-the-idea -- "an idea of freedom, of change, of human solidarity" -- represents the best of human nature, the fulfillment of its greatest promise, perhaps even the ultimate evolutionary future of all humankind. As such, Anarres-the-idea serves as a powerful touchstone not just to Shevek, but to everyone he encounters: the politicians of A-Io, who fear it as a threat of chaos; the poor workers of Urras, for whom it holds out the hope of successful revolution; the Terrans, who regard it as a choice they have forever forfeited; the ancient Hainish race, who see in it, perhaps, the possibility of something new. Judah Bierman: Ambiguity in Utopia: The Dispossessed Ursula K. Le Guin's utopian tale The Dispossessed (TD) does not merely propose another blueprint for an anarchist commune in the SF skies--an escape from sour democracies or immanent fascist tyrannies on Earth, and so from all responsibility. Subtitled An Ambiguous Utopia, this spiritual autobiography and utopian quest of the brilliant physicist Shevek explores some dilemmas in the idea of an anarchist-socialist utopia. Further, like Plato and More, Le Guin also measures how the utopian vision presses a special responsibility and an alienation on the "knower." I propose to consider two senses in which the TD world of Anarres may be read: first, that the place is only ambiguously good, and second, that ambiguity is implicit in its organizing principle, that the dominant life style is not permanently set but permits, indeed demands, personal choices to meet inevitable social and environmental changes. Though obviously linked with Le Guin's earlier SF and wizard stories, TD is a moral allegory that should be read with other contemporary utopian tales. It is a prizeworthy contribution to the debate about the responsibility of knowledge, of the visionary and of the scientist, in a planned society. The really clever thing about the structure is that by structuring the book as a spiral with events running the way they do, the structure of the book itself, the experience of reading it serves as an illustration of the cycles and spirals and sequences of time and space, and of Shevek’s theories. In the end when Shevek gives his theory to everyone, to all the worlds, and can therefore return to his own flawed utopia, he has widened the pattern, taken it out a step, it’s not just Urras and Anarres in their tidal dance, it’s the rest of the universe as well, and Shevek’s ansible will allow instant communication across the distances light crawls. He is freed to go home and to go on, and the book is freed to end with an opening out of possibilities. A 1975 NEW YORK TIMES REVIEW OF LE GUIN'S NEBULA AWARD-WINNING NOVEL - What Shevek learns is something every good Odonian should always have known: There is no universal prescription for Utopia. I've never read this book (what can I say? my reading has weird gaps) but I recently bought a copy and it's sitting on my nightstand for my next read. But I didn't think it was this sort of book? Hopefully that's just a typo - otherwise I appear to have signed up for a far weirder book than I expected. This is one of my favorite books. When I first read it back in the eighties, I was really impressed that, while Ursula Le Guin clearly identified with the ideals of Odonian society of Anarres, she asked how would those ideals would work in practice and answered, maybe not so well actually. I'm still just as impressed decades later. Take your most cherished ideals. Imagine a society built on those ideals. Then write a novel where the protagonist is a dissident in that society, surrounded by other sympathetic characters who are also dissidents, because of the ways they've been harmed by the ways their society has implemented those ideals; go into detail about how they've been harmed and how the harm is ongoing. I've never read another book like that. I don't know who else would have courage to write something like that. But Le Guin did, and it's beautiful. Since I also identify with the ideals of Odonianism, this book made me think a lot. It is. The Anarresti eat fish and grain, and occasionally fruits and vegetables. (They're luxuries on Annarres.) They're not cannibals. Finally finished this. As the final pages got fewer and fewer, I was convinced it would end with Shevek martyred as soon as he got home. Still mulling over whether I enjoyed it or not, but so much of it is really sticking with me and I'll probably reread. And I was really happy with the ending.